Thomas Cranmer was born 2 July 1489 at Aslacton, Nottinghamshire. His father was an honest country gentleman who spent most of his time in sports of hunting, fishing, hawking, and military exercises. From him the boy learnt how to ride, hunt with a hawk, fish, use a bow, and generally to exercise for the benefit of his health. Among his favourite past times was to walk and climb a hill behind the home where he could sit and meditate. His formal education was, however, poor, having as a tutor a parish priest, Ralph Morice, who was ignorant and severe with the boy. About 1504 he was sent to Cambridge by his mother ( his father having died) where he made many friends and in 1511 was elected a fellow of Jesus College. He became a Doctor of Divinity in 1523. Having married at 23, he forfeited his fellowship at Jesus College according to the regulations of the time. But his wife and child having died, the next year he was elected once again and held the post for several years. It was about this time that he began to study the foreign writers including Erasmus, before returning to Buckingham (later Magdalene) college to teach. Here his lectures excited some and upset the traditionalist clerics who, as usual, ranted and raved. He was nicknamed the “hostler” for a while as he was living in the Dolphin hostel at the time. Later they called him the `Scripturist` because of his passion for reading and quoting the Scriptures. Cranmer`s life took an important turn now and he became deeply focussed for some three years on his reading and understanding of just about any book he could lay hands on, including that of Luther that had recently been published. In particular he sought the truth of God`s word and was convinced that the only infallible source was the Scriptures. Honours meanwhile followed – in a short space of time he was made doctor of divinity, professor, university preacher and examiner. In the latter role he weaned off many half hearted monks who sought elevation in the ministry as he insisted that “Christ sendeth his hearers to the Scriptures, and not to the church”, the faint hearted complained it was too difficult and withdrew in anger ( at their own shortcomings ?). At this time his colleagues included Latimer, Stafford and Bilney. Whether serendipity or predestination we shall never know, but because of plague in Cambridge, Wolsey was visiting relatives, the Cressy family, at Waltham Abbey when Henry and his entourage stopped for the night. Secretary Stephen Gardiner and Bishop Fox stayed with the Cressy`s and were most surprised to meet their old friend from Cambridge university. In the course of supper the conversation turned to the divorce problem during which Cranmer remarked that they were attacking the issue from the wrong angle. “The word of God is above the church” , was the principle that Cranmer expounded and it framed the whole of the Reformation in just eight words. At Greenwich shortly after Henry met with Gardiner and Fox who retold of their discussions with Cranmer. Henry was excited at the prospect of having an alternative means to achieve his divorce and immediately sent for Cranmer, who had gone to Nottingham in the meantime. Cranmer was somewhat distressed that he had been involved in the matter and reluctant even when pressed by the king. 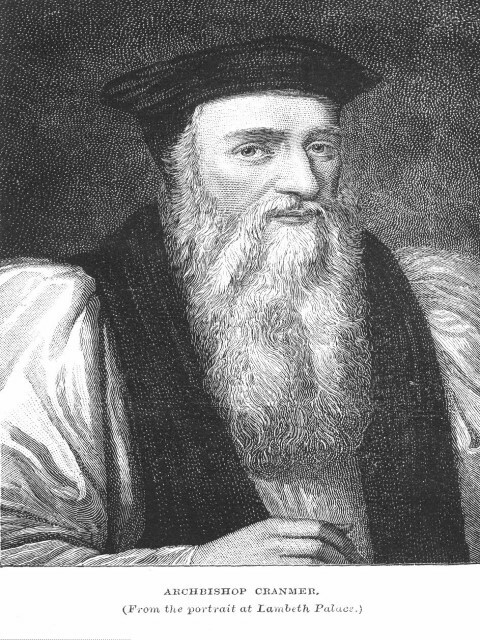 Cranmer was then requested to give a written opinion for which purpose he was lodged with the Earl of Wiltshire (the father of Anne Boleyn – sometimes called Bullen, whom Cranmer thus met.) There followed the consultation with the universities throughout Europe for their decision as to the Word of God and Henry`s desire for a divorce. Cranmer`s fortune was made. On the death of Archbishop Warham on 23 August 1532, Cranmer was appointed to the See of Canterbury. Throughout Henry VIII`s reign Cranmer was a trusted member of Henry`s government although he did not get involved in the machinations of papist Stepehen Gardiner, Bishop of Winchester. However, he continued good service to Henry in dealing with his succession of marriages, divorce etc. On the reforms, as injunctions were raised so he had them promulgated and in many ways simply kept his head down choosing concilliation rather than confrontation. Cranmer published his revised Breviary in 1538 and with the appearance in 1537 of Matthew’s Bible and the Great Bible in 1539 the services were to be led in English. This was one of the most important developments in Anglican worship. Cranmer came into his own in the reign of Edward VI, where as godfather, councillor and tutor he exercised great influence over the boy king`s upbringing. In particular he encouraged interest in the evangelical and protestant church which became an obsession with the king. 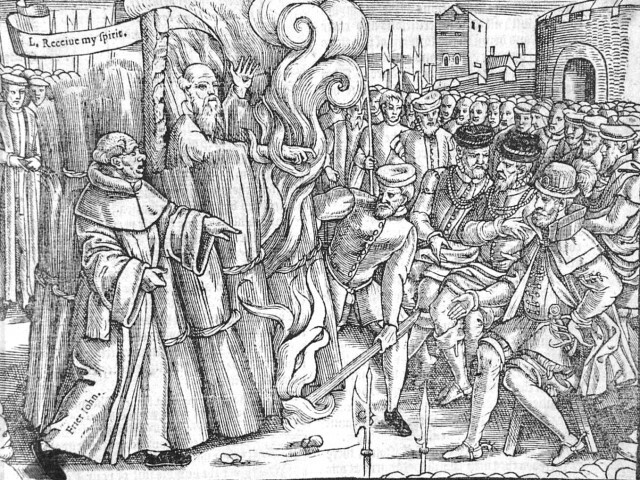 During the coronation sermon Cranmer referred to the boy-king as “a new Josiah who was to reform the worship of God, destroy idolatry, banish the Bishop of Rome and remove images from the land.” During Edward`s short reign the laws about the burning of dissidents and alleged heretics were swept away and the atmosphere became by far more tolerant. Cranmer was now able to introduce radical changes which he had been nurturing for this moment – a much more Scriptural worship that had the Romish superstitions removed. Cranmer’s preliminary steps were the publication of the Book of Homilies on 31st July 1547 together with The Order of Communion on March 1548. In due course he issued The Book of Common Prayer and Administration of the Sacraments. This placed all the church services in one volume. Not wishing to force confrontation, quite a large amount of the Romish liturgy was retained and he only selectively omitted elements such as those that implied a doctrine. But there was no pleasing all the people and complaints arose that he had not done enough. Thus in 1552 a second Prayer Book was published which was influenced by the German and Swiss church practices. In this he was as advised by Martin Bucer (1491-1551) who had removed to Cambridge when he was forced to leave Strasbourg in 1549. As a result of the revised work altars became communion tables, prayers for the dead were deleted and eucharistic vestments banned, while the Communion Service was modified. The confessional-box form of forgiving sins was discontinued, and remission of sins through gospel-preaching was adopted. Images of saints and particularly of the virgin Mary were also removed. The common people were thus encouraged to become familiar with the prayer-book and a simpler religion, in English. The untimely end of the young Edward VI brought an entirely different set of issues, with the reign of Queen Mary (r1553-8), a staunch Catholic who was married to Phillip of Spain. in 1554. She reversed everything and returned to the bloody persecution, imprisoning, and burning at the stake many Reformers. Among these was Thomas Cranmer burned at Oxford as a heretic. The charges brought against him were mainly about the doctrine of the Lord’s Supper as he stated them to be in his book, A Defence of the True and Catholic Doctrine of the Sacrament. Essentially about the validity of transubstantiation he demonstrated and believed that Christ was present in spirit and not in bodily form professed by Rome. Catholic place men who cajoled and whispered to him to recant such that he did eventually sign some papers presented to him with the possibility that the Queen might relent . But there was no hope, Mary was determined that Cranmer would burn and no amount of recanting was going to stop that taking place. “And now I come to the great thing, which so much troubleth my conscience, more than any thing that ever I did or said in my whole life, and that is the setting abroad of a writing contrary to the truth; which now here I renounce and refuse, as things written with my hand, contrary to the truth which I thought in my heart, and written for fear of death, and to save my life if it might be; and thatis., all such bill, and papers which I have written or signed with my hand since my degradation; wherein I have written many things untrue. And forasmuch as my hand offended writing contrary to my heart, my hand shall fast be punished there-for; for, may I come to the fire, it shall be first burned.